This is our 1910 30-60 'E' Rumely Tractor S/N 143. This was the 43rd one built beings they started with #101. 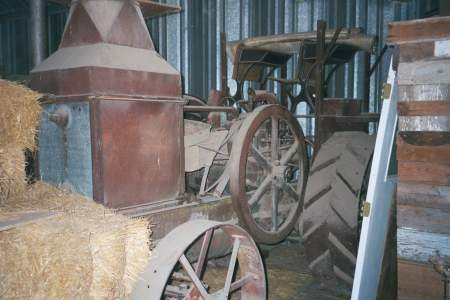 This tractor was produced on May 10, 1910. It has the large radiator and the early auxiliary exhaust. 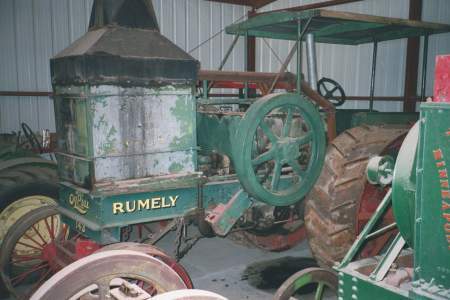 This is the oldest 'E' and oldest Rumely tractor besides Kerosene Annie. The gearing on it is excellent and we've had her running up a couple times recently. 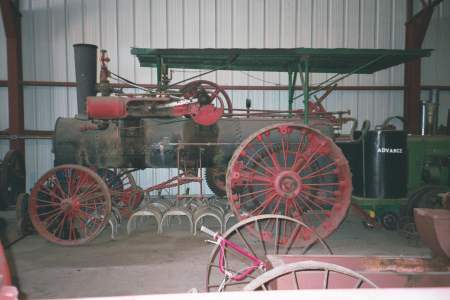 If you were at the Rumely Expo in Waverly, Nebraska in 1997 you probably remember seeing it. We hope to start it up again on its 90th birthday next year. We aquired this tractor in 1977 from C. W. Schmidt of Redfield, South Dakota. 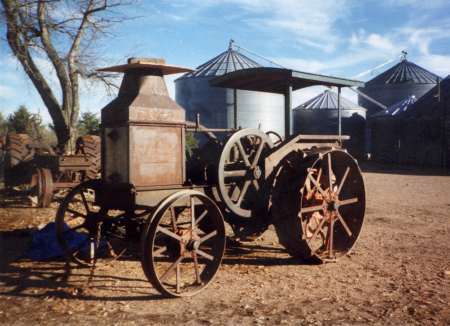 The tractor had spent its life working near Onida, South Dakota. Our 15-30 F is a 1912 model & is currently undergoing total takedown restoration. Pictures can be seen on the Features Page By Clicking Here. This is our 1919 'G' 20-40 Advance Rumely Tractor S/N 1495. This tractor was restored about 20 years ago. It runs pretty nice and the gearing is pretty good. This is our 1918 'H' 14-28 Advance Rumely Tractor S/N 9471. The 14-28 was the early model of the 16-30. It uses ignitors instead of spark plugs for ignition. It also has several other variations including, a skinnier flywheel without crank, square fuel tanks, brass fuel and water pumps (like those used on the 'F' 15-30), and several other odd differences. We got this tractor from Bill (A.K.A. 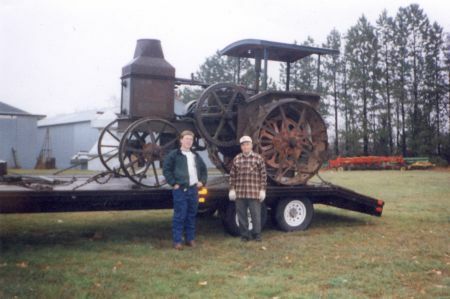 Rumely Bill) Krumwiede of Voltaire, North Dakota (shown with me in picture at time of purchase) in October of 1998. Bill got the tractor from Van Guard, Sask. Canada in the mid-1960's. In the first picture, we are doing some preventive maintance before we start it up. The picture was taken when I had it pulled up by our shop & the carb. & oiler are removed for rebuilding. I also made new fuel tanks, rebuilt the governor, and replaced the connecting rod bolts with new high grade ones. This is our 1927 'S' 30-60 Advance Rumely Tractor S/N 306. This was one of the first Rumelys we aquired back in the 60's from an auction not too far from us. We had this one running quite a while ago. We like to tell people that this is a "LIGHT WEIGHT" tractor! Here's the front view of our 1924 12-20 'K' Advance Rumely Tractor S/N 20829. As you can see it's in a dark part of the shed, but I hated to leave it of the page because it's a very cute little tractor. 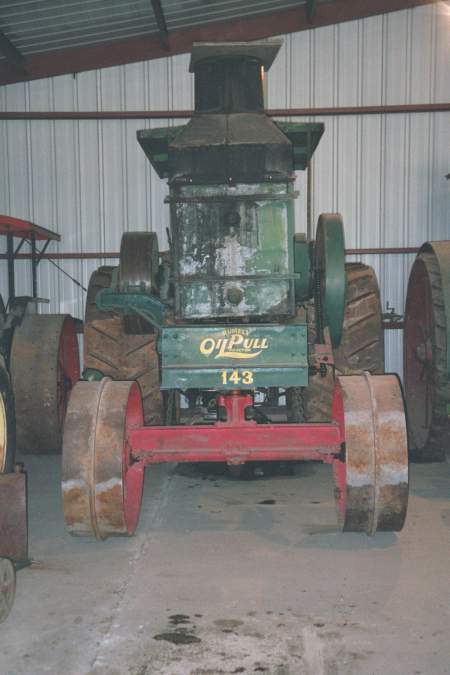 The 12-20 was the smallest model Rumely made, but it still keeps the heavy weight look. This makes them a perfect tractor for someone who doesn't have a lot of space, but wants a heavy weight tractor. This is our best 16-30 Rumely. The gearing on it is like new & runs very smooth. 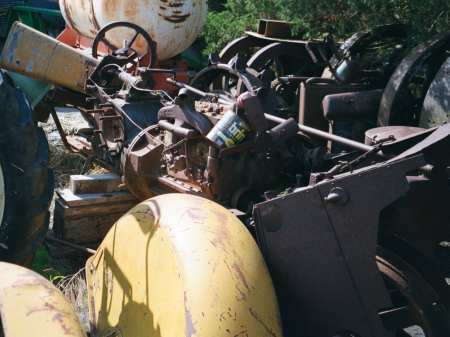 This tractor spent its life working just a few miles from our home. It is a good complete tractor, but needs some work. This is our 1929 25-40 'X' Advance Rumely Tractor S/N 1885. It is in excellent condition with terrific gearing & can be easily hand started. 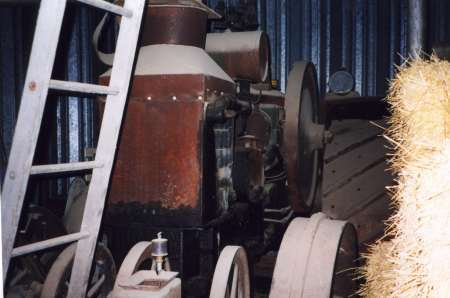 It is normally stored in a shed, but it is pictured here cooling down after a good long run. This tractor originally came from Wilfred Abels of Clay Center, Kansas back in the 1960's. It was one our first Rumelys. For pictures of this tractor in operation CLICK HERE. 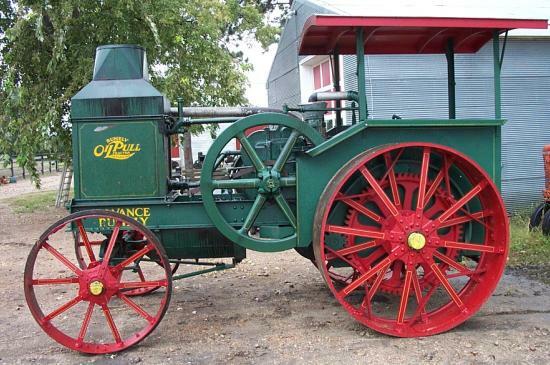 Here's the nicest restored Rumely we have. Runs like a watch & gearing is excellent. 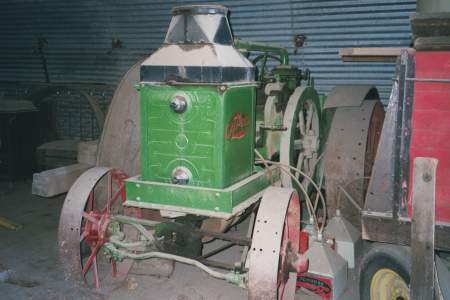 This is the model that my great-grandad owned & was the first tractor in our family. It's not the actual tractor, though I wish it was. Our original survived up at Snipe Lake Sask Canada until the 1950's but we've lost track of it since. Has anyone ever heard of one from up there? 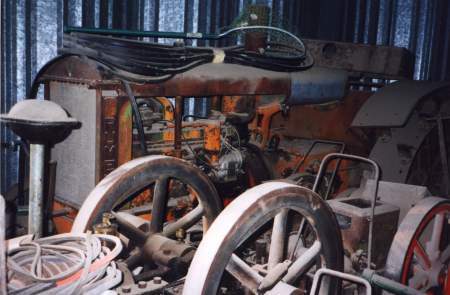 This is our Rumely 6A buried in parts & engines. This was the Rumely Company's last attempt to get into the smaller multi-cylinder tractors. This is our Advance Steamer approx. 1909. We haven't steamed it up yet, but the man we bought it from used to fire her up once in a while. 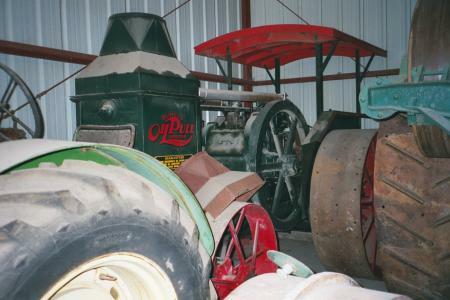 Rumely bought the Advance Thresher Co. out in 1911. OK, first off, don't laugh. There is a DoAll in that pile. That will be a good project for someone someday. 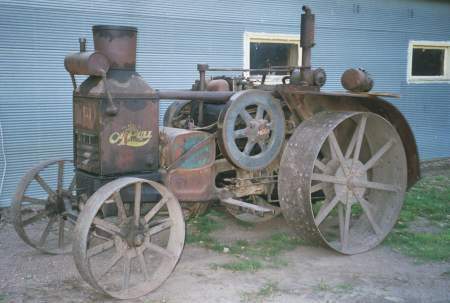 This was the first attempt by the Rumely company to go into the smaller multi-cylinder tractors. 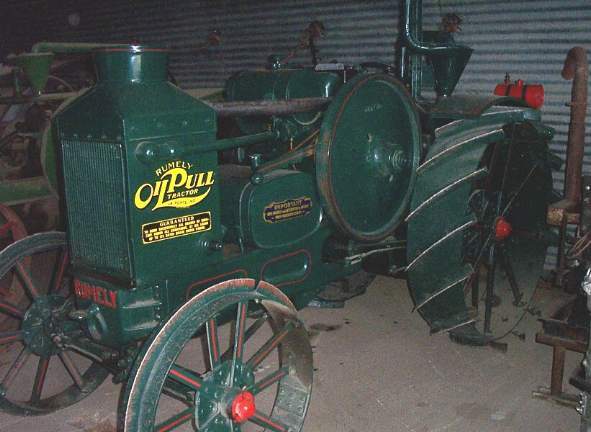 I don't think they were terribly popular, but in the earlier years, it was hard to beat the Oilpull!